As 2008 comes to a close, I am pleased to be able to report that your generous contributions have again helped us make a difference. While the coming new year will certainly provide all of us unique challenges, the work ETS has accomplished this year should at least allow all involved to feel they have received a good return on investment. The effort I started four years ago with RTCM and COSPAS-SARSAT, which resulted in major changes to the basic standards to which all 406 MHz distress beacons are certified, has now borne added fruit. This year RTCM published a major re-write of the standard for 406 MHz PLBs (Personal Locator Beacons), ensuring that these ever more popular distress beacons will be tested to a more stringent standard, one designed to more closely relate to the way in which these beacons are used in the real world. The new standard has been passed along to the FCC for action, but in the meantime some of the PLB manufacturers report they are already designing and testing to the new specifications. The new standard includes improved instructional labeling on the PLB, helping to ensure that an untrained survivor can operate the device to siginal their distress. For the first time ever for an RTCM standard, it also includes requirements for plain language labeling on the consumer packaging to enable purchasers to make a buying decision based on features, or lack thereof, that may not be readily apparent otherwise until after they unpack the PLBe and read the instruction manual.� Mind you, we cannot mandate what is advertised, but I think at least some of the manufacturers will also include this information in their specification sheets and web site copy. Work has continued all this past year on Appendix G of the new PLB standard that will, for the first time, include rigorous simulator based testing of GPS receivers included in PLBs.� This has proven to be a much. much more difficult standard to develop than first envisioned, but we are almost there.� RTCM is really pushing the technology and plowing new ground in this work. �Credit is due NASA, who have done the bulk of the developmental testing and analysis, and to Spirent Communications, who are a major manufacturer of GPS simulators, for their significant assistance (admittedly, to their benefit). The new tests will stress GPS receivers under simulated conditions in both land and marine scenarios. It will provide a baseline minimum level of performance, while also encouraging manufacturers to do even better. It is specifically designed so that we should be able to readily raise the minimum as better GPS receivers are developed and become available.� This is, itself, a unique concept in standards development, which too often sets a benchmark that becomes obsolete too quickly.� We hope to finalize this new Appendix G this coming year. As our work on the PLB standard drew to a close, SC 110 has started work on the next big project, updating the EPIRB standard to reflect the advances we've incorporated into the PLB standard. It's an ongoing process to ensure that end users have the best distress signaling devices available that will really work in an emergency.� Having already fought� and resolved many of the same battles in the significant revision to the PLB standard, we have made much more rapid progress on this revised EPIRB standard and hope to have it completed this coming year. As I have discovered often in the past few years, if you point out issues, you are likely to get tasked with solving them. �A combined SC101/110 committee has been able to move quickly. In just a year’s work this standard has been essentially completed except for portions that must now wait on international committee action and the finalization of the RTCM work on Appendix G, portions of which would likely be incorporated. This past year has seen the SPOT Satellite Messenger exploding on the market with tens of thousands of units sold and a growing number of successful rescues to their credit. I have been one of the few who SPOT has not captivated with their aggressive and very effective advertising and public relations efforts. 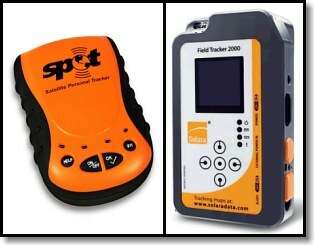 While SPOT offers a number of useful features and a low entry price, it also has plenty of potential pitfalls and problems, both with the device itself and its integration with SAR resources. �I have been active in communicating my concerns, both directly with SPOT and to the SAR community at large. I gave a pretty forthright presentation on the subject at the RTCM annual conference, "What Price Your Life? Distress Alerting as a Commercial Service." 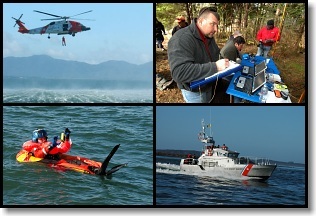 �This resulted in an invitation to give the presentation at Coast Guard Headquarters in Washington, D.C. �I was also invited to sit on a panel discussing these devices by Canada’s Search and Rescue Secretariat at their SARScene 2008 annual conference. At least in part as a result of my encouragement and efforts to shine a bright light on some of the fundamental problems and lack of standards for these devices, the U.S. Coast Guard has requested that RTCM develop a standard for Satellite Emergency Notification and Locating Devices (New Acronym Notice: SENALDs) which will set minimum performance specifications for devices such as SPOT and the Solara Field Tracker 2000. This month the RTCM board of directors established a new subcommittee (SC 128) to develop this standard. While this will not address the deficiencies in the locating, alerting and SAR notification process, it will help ensure that the device itself should function reliably and interface in a functional manner with the user seeking to send a distress message. I envision that this standard will be modeled on the relevant portions of the new PLB standard and will eventually become an international standard and part of FCC regulations coving these devices. Meanwhile, I continue to push for improvements in the alerting and SAR notification process. Recently, ISO, the international, but Europe-centric, standards organization introduced an ISO standard (9650) for recreational/yachting life rafts and almost all the raft manufacturers have jumped on the bandwagon, offering so-called ISO life rafts. Consumers see �ISO� and based on their perception of that representing a form of quality assurance, assume that the raft is somehow certified to a high standard, making it a better choice. Unfortunately, �not exactly,� as the advertisement says. In the first place, there is no central certifying authority. While a few of the manufacturers have chosen to have an independent agency certify that they meet the ISO standard, most have not. More to the point, because there isn’t a single authority, even if certified by some agency or organization, it only means that it meets the ISO standard, as interpreted by that organization. Based on what I have seen, that interpretation varies widely. This leads to the second problem with the ISO standard, which is that it is a terribly vague standard in many respects, lacking badly in others. It is a politically influenced beast, developed for the most part by and to the advantage of mostly European manufacturers to further their bottom line. The ISO committee that developed this standard is the worst kind of �old boys club� in this respect, more so that even the usual ISO exclusive club mentality. �The standard is not quite worthless, and it has some good parts, but it is almost fraudulent in that it provides a false sense of security to consumers looking to purchase a raft that might save their life, or not. My experience suggests that buyers had best beware and that claims to meet the ISO standard are not worth a whole lot in some cases. I saw a few good rafts, some that were adequate, and some that I considered not to meet the standard to varying degrees, by my interpretation. As a result, we’re considering conducting a more thorough examination of these new rafts, and others, but the significant costs involved in such testing to ETS standards are an issue we will need to overcome. I also continue to participate on the SAE S-9 Cabin Safety Provisions Committee and SAE S-9A Safety Equipment and Survival Systems Sub-committee developing enhanced safety and survival standards for transport category aircraft, airlines and, by default, general aviation. Meeting only twice a year, progress is often excruciatingly slow. That seems to suit a few of the participants just fine, as some seem very opposed to any change in some areas. While each committee member is supposed to use their industry expertise to advance safety for the benefit of all, leaving their corporate hat at the door, one representative of a major airliner manufacturer and one of their primary suppliers clearly are determined to oppose virtually any advance that might possibly increase costs, even though it would not result in any competitive disadvantage since all must meet the standards. Safety concerns are a distant second in their single-minded fight to restrain costs. Given that so many of us put our lives in their hands so often when we fly, one must wonder if such an attitude permeates others areas of engineering at this company? I find that an unsettling thought. In any case, because these are supposed to be consensus standards, it’s not that hard for a few motivated opponents to prevent progress or slow it to a crawl. On a positive note, that has not stopped us from nearly completing the new Aviation Life Vest standard. I had hoped it would be done this year, but as noted, some things just seem to take more time than they should. The effort to significantly revise and improve the outdated Aviation Life Raft standard has again stalled due to the opposition noted above. The past year or so has already seen it watered it down significantly, but as we get closer to finishing, they now seem to be trying to eviscerate it. The next year will be critical in the fight to get these new standards passed and will determine whether the past six years' effort was in vain. 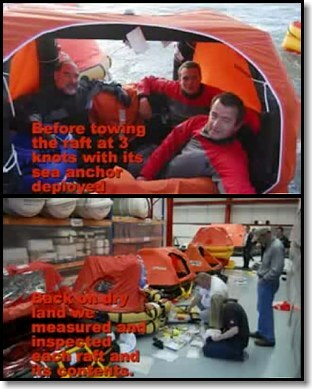 The improvements we are trying to make are based on the life raft tests and research performed by myself and ETS Foundation over the past decade that revealed serious deficiencies in many aviation life rafts. I and those others on the committee dedicated to saving lives will continue to fight for better safety and survival equipment and oppose these efforts to your life behind their corporate concerns. Earlier this year the Equipped To Survive Foundation conducted a comprehensive test and evaluation of PLBs for use by U.S. Coast Guard aircrew and rescue swimmers, pursuant to a competitive contract award won by ETS Foundation late last year. This included both laboratory and field testing. These PLBs are replacing the 121.5 MHz Mini-B EPIRBS that had previously been carried and which are being rendered obsolete this coming February due to the cessation of 121.5 satellite alerting. Have you gotten your 406 MHz PLB or ELT yet? The 248-page evaluation report was delivered ahead of time and under budget. The Coast Guard subsequently made a purchase decision based on the report and is well on its way to equipping their aircrew and rescue swimmers with the PLBs.� It was an honor to be able to provide a service for the brave men and women of the Coast Guard who risk their lives for others, and to know for sure that the government got a really good value. Funds from this T&E contract have helped support some of my activities this year. ETS Foundation will be working to capitalize on this success in an effort to provide more such services to the U.S. military and others in need of test and evaluation services which benefits both ETS and our service members. We have continued to add additional product reviews and new product information to the ETS site, as well as revising and updating old reviews and articles. We uncovered, researched and documented a number of distress signaling product failures this year, including warning consumers of defective signal mirrors from one manufacturer and fake Chinese signal mirrors from a number of importers. Our reports on new survival related gear at both Outdoor Retailer and SHOT Show continue to draw large numbers of viewers. The ETS Survival Forum continues to experienced a good deal of traffic and membership continues to grow. Every time we have some sort of natural or man-caused disaster more people discover they have to become more self-sufficient. Volunteers Chris Cavanaugh and Marty Facazio continue their excellent performance as administrators of the forum, keeping peace when matters get too hot and helping newcomers. Our annual April Fools (March 32nd) Edition of ETS Survival News was once more a big hit. Yet again, I received many emails assuming it was all true. I owe special thanks to Clifford Grout and Chris Cavanaugh, whose warped sense of humor compliments my own and helps make this annual such a success. If you missed it or previous editions, you can find them all here on ETS. This past year I provided survival education presentations at a number of aviation gatherings including the annual meeting of the International Association of Natural Resource Pilots, various EAA chapters, AOPA Expo and Cirrus Owners and Pilots Association (COPA). �COPA continues to support my delivery of a 3-hour survival module at their many Cirrus Pilot Proficiency Programs.� This coming year I’ll continue with that program and have already been booked for numerous other aviation events. I continue to provide free advice and information on survival equipment to troops embarking to the Middle East and to many life support personnel in the U.S. military.� It was gratifying at the annual SAFE Association Symposium to have so many life support specialists in the military stop by the booth to thank me. There is nobody else doing what I do, and I cannot do it without your support. In these tough economic times there will be those who hope to skate by and get away with less than they should. Without a consumer advocate at the table, they might get away with it. I remain the sole consumer advocate who participates on any of these standards committees. Attending these meetings and working on these standards takes time and money, there's no getting away from that. As you can see from this year's report (and previous years'), your investment is producing excellent returns. Please support ETS Foundation with a generous financial contribution so that I can continue this work on your behalf. All this work is only possible because of generous support from the public, including many of you. Thanks again to all our contributors this past year who recognize the value of the work we do and the tremendous value we provide for each dollar donated. Please give generously to help us continue our work. You can make a tax-deductible donation here. Equipped To Survive Foundation's Form 990 and year end recaps from prior years can be found on the ETS Foundation Home page. © 2008 Equipped To Survive Foundation, Inc. - All rights reserved.